Imagine you are in a cab, on your way to a meeting. You have done your research on the topic to be discussed. However, it strikes you at the last minute that you should study the patent portfolio of the client you are meeting. Using the Relecura mobile app, you can get this information on the go – Launch the app, type in the company name, and hit search. 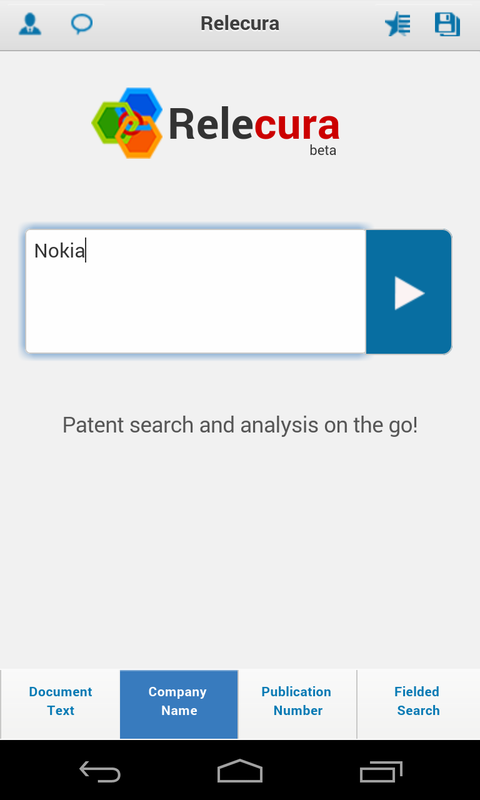 With this app, we have endeavored to make patent search and basic analytics on mobile devices simple and meaningful. We started out with the conscious decision to create an app that was simple, quick, and yet comprehensive. While quick tasks for seeking information on the go are simplified using this app, one can dig deeper as well. We have incorporated features for advanced users as well and plan to add more in future. Let me demonstrate an actual analysis to give you a better picture. Microsoft and Nokia announced a unique deal wherein Nokia’s Devices and Services business will be acquired by Microsoft. 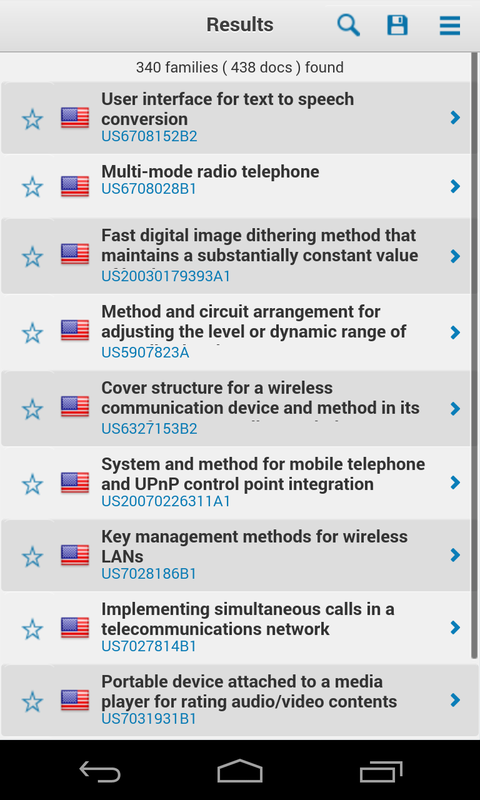 What Nokia will hold on to is ‘wireless networks’ and ‘mapping software’ and a large number of patents. A long-term patent licensing agreement with Microsoft has been agreed to for these patents. Curious if there were any assignment transfers between these companies in the past, I opened the Relecura Mobile App. The home screen provides an option to search using company name. So, I typed in Nokia and got back 115,110 results. Using Relecura’s ‘Browse’ feature, I refined these results. I specified the first parameter as Original Assignee and selected Nokia from the list. 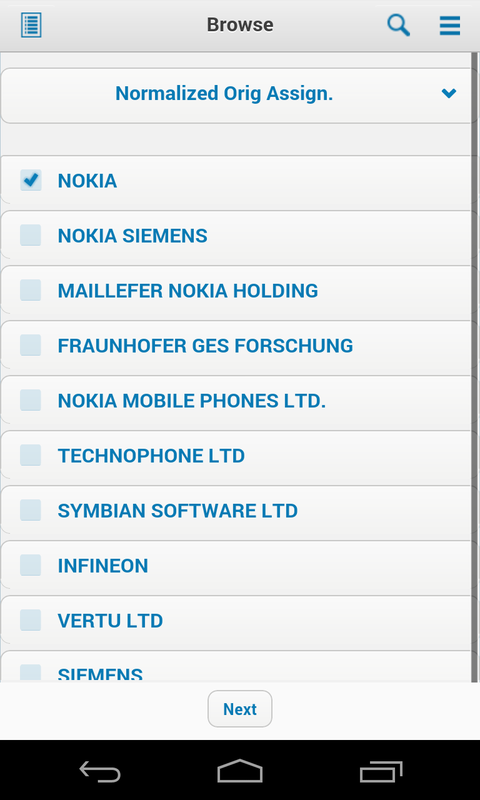 On the next screen I selected the second parameter as Current Assignee and it automatically displayed a list of companies to whom Nokia had transferred patents. In the list was Microsoft, of course, tapping on which gave me a list of 438 documents to study. The list conveniently displayed the titles for patent documents so I could quickly scroll through them. 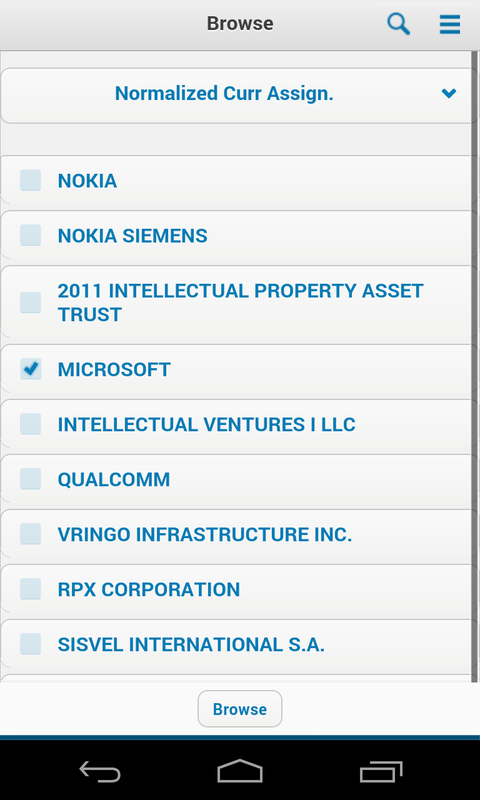 I could now analyze the types of technologies transferred from Nokia to Microsoft in a matter of a few swipes and taps. Now, 438 documents still seemed like a lot to study. Moreover, I was only interested in a couple of sub-technologies. I selected the ‘Explore’ feature that displays the top keywords, concepts, and classification codes in the patent set. I chose the concepts ‘Data transmission’ and ‘Mobile station’ to further refine these results to 151 documents. Consequently, with the ‘Cluster’ feature, I could quickly bucket these under categories of keywords or classification codes. I was able to do all this in under five minutes. If you wish to carry out a detailed study of the multiple technologies and your mobile screen feels a bit small, you can seamlessly move to the desktop. Save your search results on the mobile app and log on to the Web-based Relecura (you will have to purchase a license for this, since it does not come free with the app) on your computer. The result set will be waiting under Saved Projects, for you to study in detail. Though sharing results from the mobile app to the Web-based Relecura would require you to have a paid account the other way around is quite simple and free, that is if you already hold a paid web account. You can share results from your desktop to a mobile app user (yourself or your colleague/manager). An ideal use case would be when you want to show the final result of your analysis to your manager or a senior (to take an example). The manager can—in this case—not only view but also carry out further refining operations on this data set to get additional insights of interest on the patent set you have mined and provided. Let’s imagine another scenario where you are in a meeting. The discussion has veered away from what you had prepared for and you need some additional information. The Relecura mobile app can help you quickly gather that information, so you can support your arguments with data. There are many other features such as ‘Graphs’, ‘Citations’, ‘Seed Data’, and ‘Export’, you could explore for your specific needs. Do try them out and as always, we’d be happy to receive your feedback. If you have not already downloaded this app, it’s available here for the Android platform and here for iOS.